Unfortunately, occasional budget leaks are bound to happen – even the best budgeters and money-trackers alike experience them. That’s why it’s so important to track your expenses. Doing so helps you stay on top of your finances enough to see where you might need to make some changes. If you’re trying to get your finances on the right track this year, take an honest look at each item on your spending list. Ask yourself if it’s absolutely necessary, or if it’s adding value to your life. If it’s not, then you know what to do! Not sure what budget leaks you may have? 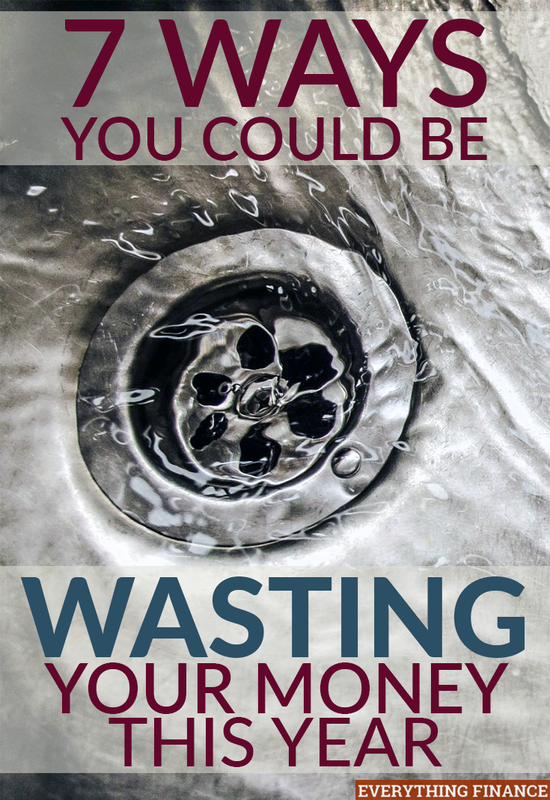 Here are 7 common ways people are wasting money in their everyday lives that you should watch out for. After decades of cable companies convincing us to part with $100+ per month for the privilege of watching poor-quality TV shows (I’m looking at you, reality TV), there are so many different, better, and cheaper options available today to watch our favorite shows. Hulu, Netflix, Sling TV, and that little place called The Internet have come to the rescue. I’ve gone in depth before about what why you should ditch cable TV, so I won’t rehash most of that, but paying for cable TV is (hopefully) going the way of the dinosaurs. I waved my middle finger goodbye to my cable company months ago. If you haven’t already done that as well, make 2016 the year you ditch cable for good. Although shopping at the mall used to be one of my favorite “hobbies,” I can hardly stand it today, and I’ve decided that there’s almost no reason for me to step foot inside a mall ever again. Due to the endless opportunities to shop, browse, and spend my money, it’s not a place I enjoy going anymore. I don’t know many people who can resist the temptation of impulse spending at a mall. I know I certainly can’t, and if you’re in debt, then shopping at a mall is even worse. Personally, I just don’t need the temptation. I got myself out of the mall habit a few years ago, and whenever I step foot inside one now (which is rare), I find myself becoming overwhelmed. The last time I went to a mall (to exchange a Christmas gift I was given for the correct size), my goal was to get in and out as quickly as possible. However, after locating the correct store out of 200+ stores in the 1,000,000+ square-foot mall (no joke), locating the single item I needed to replace, finding a customer service desk to help me, and waiting in line, the whole process took about 45 minutes of my precious time. My time (and money) is worth more than spending it at the mall, and yours is too. According to the Self Storage Association, there are enough storage units in the United States today for every single person to have 7 square feet of space. That’s right. Storage units are big businesses, and they make a ton of money off of our attachment to things. But how meaningful are these things to us if we keep them in dusty boxes in a location outside of our homes? There’s a right time for renting a storage unit, and it should always be temporary. Moving, going through various life changes, figuring out what to do with your loved one’s things after they pass away, and to contain business-related equipment all come to mind as good reasons to rent a storage unit. Storing excess clutter from your home, seasonal items, and sentimental boxes of things from your childhood aren’t good reasons to pay a monthly fee in order to house it all. Memories belong in your heart, and if you’re storing your extra things in a dusty old storage unit, then they must not be that important to you after all. Save yourself from this monthly expense by donating your excess clutter to charity. Buying a brand new car is questionable in its own right, but leasing one is even worse. After paying thousands of dollars to drive around a high-end car for a year or two, you have nothing left to show for it at the end of that lease. Nothing. Is it really worth the thousands of dollars and working hours you’ll spend to earn the money to drive around in a fancy car that isn’t yours, to try to impress people who really don’t care what you drive anyway? The answer is obvious. Cell phones befuddle me. We didn’t even need them 15 years ago, and now they’re so common, even grade-schoolers have them. They’ve progressed from simply allowing us to make emergency phone calls to becoming mini-computers that keep us connected to the internet and our family members, colleagues, and acquaintances all at once. They encourage us to always be working and to be available to anyone at the drop of a hat, and they’ve become permanent extensions of our hands. For most of us, myself included, they’re an unhealthy addiction. Not only that, but they’re ridiculously expensive to own. Since when did it become okay to pay upwards of $150 a month just to keep a phone in our pocket? There’s no need to shell out hundreds of dollars to national cell phone companies just so we can have the latest iPhone. The plan I have for my smart phone is $15/month, and it only allows me to be connected to the internet when I’m in a WiFi area, which suits me just fine. It keeps me off my phone when I’m supposed to be doing more important things, and it keeps extra money in my wallet. I’m always okay with that! I’m a voracious reader, but I haven’t purchased a new book in years because I can get so many books, magazines, and movies at my local library, all for free, including new releases. If there’s a title on the bestseller list that I want and they don’t have it, I offer the suggestion to the librarian, and they have it for me within a week or two. Libraries have huge budgets to buy new books and other media, and they don’t mind getting suggestions from their tax-paying patrons. I’d rather let them spend that $30 on that new bestseller so I can save it instead. If you have any of these budget-saps stealing your money, it’s time to consider letting them go for good this year, and there’s no better time than now. Your wallet will thank you. Do you have any budget saps that you could let go of this year? What are a few that you’ve let go of in the past?